Flight Ways: Life and Loss at the Edge of Extinction was published by Columbia University Press in mid 2014. 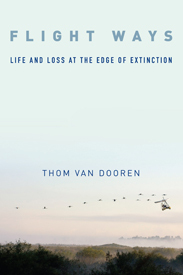 A leading figure in the emerging field of extinction studies, Thom van Dooren puts philosophy into conversation with the natural sciences and his own ethnographic encounters to vivify the cultural and ethical significance of modern-day extinctions. Unlike other meditations on the subject, Flight Ways incorporates the particularities of real animals and their worlds, drawing philosophers, natural scientists, and general readers into the experience of living among and losing biodiversity. Gregg Mitman, 2016 “Life in the Ruins” BioSocieties. Eva Giraud and Gregory Hollin, 2016 “Thom van Dooren’s Flight Ways: Life and Loss at the End of Extinction“, Somatosphere, June 17. Ben Garlick and Franklin Ginn, 2016 “Review: Flight Ways: Life and Loss at the Edge of Extinction by Thom van Dooren,” Progress in Human Geography, 40.1, 149-154. Paul Banko, 2015 “Book Reviews: Flight Ways: Life and Loss at the Edge of Extinction“, Journal of Field Ornithology, 86(2), 180-182. Aidan Davison, 2015 “Book Reviews: Flight Ways: Life and Loss at the Edge of Extinction“, Geographical Research, 53(3), 336–344. Matthew Calarco, 2015 “Animal Studies“, The Year’s Work in Critical and Cultural Theory, pp.1–20.